For the MP3 version of this podcast (audio only) click here (18.6MB). The show opened to the public on a glorious fall Thursday. I had the better part of the day to check out the show floor. 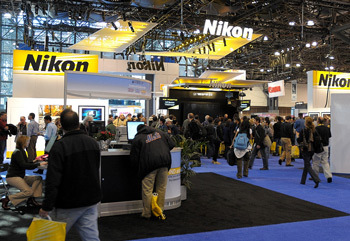 Upon entering the Javits Center, Nikon Corp. had a very large area to the left of the doors and competed for my visual attention with the Canon booth. Guess all is as it should be within the photo industry. Also looking big were Casio, Sony, HP, Epson, as well as many of the accessory companies. All in all, I agree with the show publicity that there was much to see for all. Although most of the major vendors had chosen Photokina to launch major product announcements, I did find a few to whet your appetite for NAS (Nikon Acquisition Syndrome or GAS (General Acquisition Syndrome). My major impression from the show was that video and still photography are on a road to a merger. Nikon with the D90, Canon with the EOS 5D MKII large pixel format model, as well as even Casio are showing their camera's video capabilities. I think all future cameras will be including these specs. It was not enough to know all the current digital terms, but now we will add many more videographer terms. I'm hoping Nikon soon shows us more full frame pixel models like the D3/D700 platforms or they might soon be seen as playing follow the leaders to Canon, Leica, Sony. A couple of new hardware products I found are the Lowepro "Classified AW" Series of 4 new bags designed by and for photojournalists. They looked to be a good, waterproof design with a unique design of folding top not seen another bags. Also introduced is the Lens Trekker 600AW which holds a 600mm with body or 800mm lens sans body. Nice if you have one of those. A new release for Boda Bags was a unique side holster model in both large and junior sizes. Check out their nice web flash product show. This is a light and easy universal mounting arm. Retailing at $79, it allows a camera to be clamped to many surfaces with a flat clamp. Great for windows, edges, and other structures. 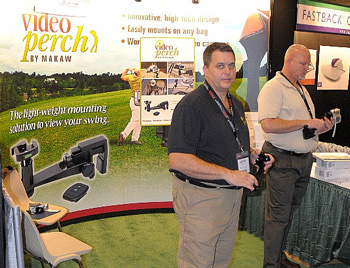 Designed by a couple of golfers to hold a video camera, it is something I had not seen before. After my input and them seeing my Arca Swiss style plate on my D300, they agreed to add a non quick release option and will look into this new to them style of quick release. Here is what I found to be the best in class of the book self publishers. The quality was incredible. A Softcover 8x10 book of 20 to 40 pages was $19.95! Also unique is that books are kept on line so orders can be placed directly at the website. The author does nothing but receive the income check. A real class act and a very busy booth. I was pleased to run into the Datacolor Spyder support rep, Dave who had presented to the ANPAT 8 group at Yosemite. He was displaying photos achieved with the help of their monitor and printer color calibration tools. His booth included the new Spyder3Elite, which Datacolor is describing as the next generation in calibration accuracy, precision and speed. Hint: There are rebates currently available from Datacolor for the Spyder products. Make sure you check the Nikonians Photo Pro Shop for this product. This vendor is a leader in the Promote, Protect, and Preserve market. They showed a wide array of options to choose from. Here is a great way to move your film slides and video to DVD or CD. Send them all your old boxed up stuff and they convert it for you. (Although I did not see them at the show, www.scancafe.com is another option). Here is a new company hitting the ball out of the park for integrated ways to "Register, Protect, Assign Rights, and License" your photos. A major issue for all of us is the ability to protect our rights after we take a photo. 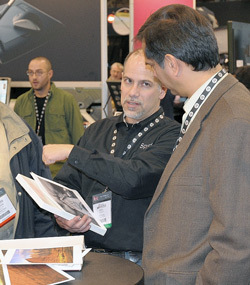 To wrap up, the show had everything for the professional on down to take, produce, print, publish and distribute images. There was a wide variety of web based services from starting/building/hosting websites. It appears there is much more to offer all of us in that area. A few that caught my eye are, ANIMOTO to turn pics into video presentations, MOODBOARD to offer stock photo sales, SITEDESIGNWORKS and LIVEBOOKS for site creation. I failed to mention that EPSON, CANON and HP all had big displays for printer technology that was truly brilliant and dazzling. Along with remote print companies like MPIX, and the book self-publishers, there is no excuse for not producing stunning hardcopy for yourself or for sale. So -- grab your camera gear and get out there and shoot. Remember, the pixels won't do it by themselves. Nine photographers and six models got together in a small theater, and On Location's host Martin Joergensen was there to shoot models and try new stuff with flashes. A few impressions from the shoot as well as pictures of the models and some tips on touching up model images. 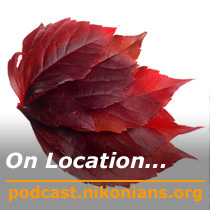 The episode both covers shooting fall outdoors in your local neighborhood as well as shooting indoors in a makeshift studio, where the aim is to get autumn leaves isolated on a white background. A few samples of the shooting both indoors and outdoors as well as a super short course in isolating stuff on a white background. Vivaldi's Concerto No.3 in F Major Allegro, probably better known as Autumn from the Four seasons performed by American Baroque on Magnatune. A maintenance upgrade has been installed. Members will notice that they will be asked to login with their username and password, even if they had an open user session. This is a result of an improved procedure which now will allow Nikonians to access both the forums and galleries with a single login. Members will also notice that they will be asked to login manually (this one time) with their username and password, even if they had their automatic re-login option set to "yes." 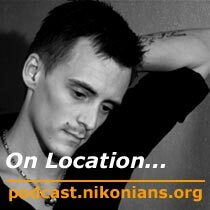 For the MP3 version of this podcast (audio only) click here (20.6MB). For Digital SLR shooters who are on the cutting edge of configuration settings to maximize their image quality, ToneUp is a familiar name. Todd Gibbs' software tool gained popularity early on by overcoming Nikon Capture limitations such as the ability to swap built-in curves between Nikon DSLR models. Nikonians is pleased to announce that Todd is offering a significant fifty (50) percent discount on all products to our Silver, Gold and Platinum members, including his latest iteration of the custom curve program - ToneUp Studio 3 and his newest addition - the TetherPro tethered shooting utility. Nikonian looking for wildlife shooters interested in Wolf Haven tour in Washington. "Problems when photographing in public places", "Upsetting Reaction" and "Rockslide in Yosemite". Martin also talks you through some arguments for using wireless triggers rather than Nikon's CLS - the built-in flash exposure system. A few of the not-so-interesting samples and some shots of the Flash Waves trigger system used for the shoot. 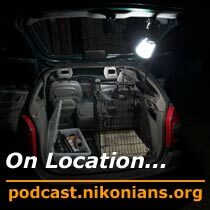 Nikon CoolPix involved in spy scandal! Hoya ceases Pentax production in Japan. October's Online Photo Assignment is Colorful Backgrounds. Nikonian Ladies' October theme is Fall Foliage. "Assumed to be a pro? ", "You feel lucky punk? Well, do ya?" 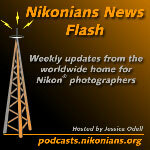 and new Poll "Nikon going windows? What's your 'Photo Platform'?". For the MP3 version of this podcast (audio only) click here (19.3MB). 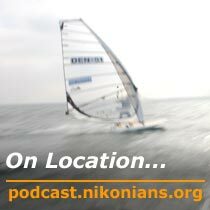 Thom renders judgment on Nikon's newest FX sensor camera and finds his closest match to his film days. I've now had the chance to shoot with the D300, D700, and D3 on extended trips. Which would I pick? Well, it's looking like the D700, as that's the way my Ready Kit is packed. For the first time in a long time I'm close to where I was when I was shooting film.